Changing your life is not easy, you have to want it and you have to work for it! I will share the number one change I made to lose weight, but first I am going to share why it was so difficult to do this one thing. Obesity is so often a symptom of stress and low self esteem. I know, for me that was a huge part of it. The other large part was growing up and learning to associate food with comfort. In green, at eleven years old. Since childhood, I have been obese. I weighed 260 when I graduated high school, and over 300 pounds after I had my first child in 2005. December of 2017 was the first time I got down to a healthy, normal weight. While I had yo-yo dieted many times before, I never reached a healthy weight those other times until I made the most imoprtant change. When I started this weight loss journey I was 35 years old. I had been with my husband for 13 years and I had two kids who were then 8 and 10 years old. 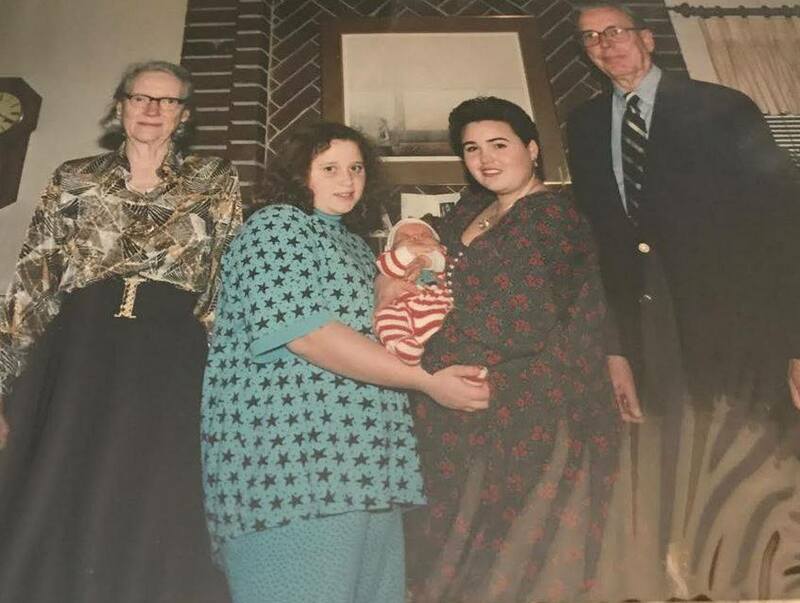 I was a fat kid, a fat teenager, a fat adult, and a fat mom. Being heavy was such a huge part of my identity. This was our longest time we have ever been away from kids! Three nights in Vegas 2013. It was so fun! My weight was the first thing the outside world saw about me. It was the first impression I gave everywhere I went. For that reason, I had a hard time making friends, I was criticized and put down at work, and people did not treat me with respect. I was used to feeling alone and mostly ignored by society in general. Listen, like it or not, we live in a world where people judge you by your looks. At best, most people would pity me or worry about my health. At worst, as I experienced almost daily, people would be extremely rude and judge me harshly for my weight. One person recently said to me that I may have just imagined being ridiculed for my weight! That person wants to believe we live in a society where people aren't really treated poorly because of their weight. Let me tell you the truth. I did not imagine being bullied non-stop and called "fat cow" for 12 years straight through elementary school, middle school, and high school. I did not imagine my boss ignoring my ideas and passing me up for promotions while he joked about my weight with my co-workers, and gave me frequent lectures about how I should eat less. I did not imagine strangers screaming insults at me from their cars when I walked down the sidewalk. This has happened to me multiple times. I did not imagine my best friend, at the time, getting drunk one night and going on a rant she sees fat people as disgusting and inferior. Oh but, it was okay for her to tell me that, in her mind, because she rationalized that she didn't think of me as fat even though I was 325 pounds and 5'5''. I also didn't imagine that the man I had been in love with since I was 12 years old, would dump me and kick me out at 19 years old because, "I keep asking you to lose weight and you haven't. I just can't make myself be attracted to you anymore." Since people told me I wasn't good enough my whole life, I believed it. My self esteem plummeted and I just allowed people to treat me like I was worthless, because I believed I was worthless. Feeling rejected, hurt, and disappointed never motivated me to lose weight. It very much did the opposite. When I felt hurt and worthless, I used food as a way to punish myself. I would binge eat until it hurt and I did not care what it did to me. I was slowly killing myself and if I continued down that path I would have killed myself. Food was constantly there for me, my whole life. In addition to punishing myself with over eating, I used food to comfort me through stress, then I used it as a reward when things were going well, and I used it as a celebration in the best of times. It was not until I made the commitment to love myself that I was finally able to change the way I think and lose 175 pounds. In less then two years, I went from 325 pounds to 150. Loving myself is the #1 change I made to lose so much weight. To lose weight, I had to love myself. Today I feel confident, proud, strong, and peaceful. I manage stress well, I avoid drama, and I strive to constantly learn and improve. All this changed because I decided that I deserve to be happy. Now I can tell you, without a shadow of doubt, that to lose weight and keep it off you need to love yourself! You need to know that you deserve to live your best life! No matter how lost you feel, or how much you worry that you can't, believe in yourself. Once I proved I could do this for myself, I starting educating myself on the best way to help others. I took a class on life coaching and I am currently working on three different certifications from the National Academy of Sports Medicine. I have learned that to help others, I need to offer support, guidance, understanding, and inspiration. The journey to love yourself and reach your health and fitness goals is different for every person, but if you need support reach out to me. I would love the opportunity to coach you to success! After some thought, I have decided I owe an apology to some of my readers for this post. It’s not that anyone said anything negative about it (in fact, many people shared positive opinions), but as I reflected on it- I thought of the person I once was and how I would have felt reading what I wrote. It made me realize I may have unintentionally triggered or offended some people. Allthough my post was an honest recollection of my past, I hate the idea that it might leave someone who is currently struggling with their weight to feel hurt by the reflection of how society can treat those of us who were, or are, heavy. Also, by only reflecting on the negative, I am sharing only a small part of my truth. The full truth does include many people who loved me regardless of my weight, including coworkers, bosses, and friends that are still close to me. My husband and my family accepted me and loved me at every size. It is important that I emphasize to those who are struggling to lose weight that you do not have to lose weight to be worthy of love, especially from yourself. It is only the opposite that was true for me, that I needed to love myself to lose weight. I started by loving the person I was, at 325 pounds. I loved my body the way it was because it was the body that gave me two children, had arms to hug, had a mouth to speak, and had ears to listen and learn. I loved my body enough to nourish it with good food and fight for better health. Now I have this to say to the beautiful, strong girl out there somewhere, reading this. If you’ve been hurt like I was by people who mock you for your weight- I want you to know I believe in you and you ARE PERFECT just the way you are!!! I trust you can lose weight if you choose to. I will support you and I’m so sorry if I hurt you with this post. You are a person who deserves compassion, love, and care. Thank you for reading my journey. As a coach I’m learning and evolving. I will use this as a constant reminder to consider the feelings of my readers and clients.